Assuming you have a valid Squish license, and there is an application you want to automate, lets start our Squish journey. The first thing that needs to be done is to install Squish on your machine. A prerequisite for installing Squish is that you should have Java JDK on your machine. After you are done installing JDK from Oracle’s web site, you need to download the specific squish package needed for testing your application. Every Squish package name is of the form squish-<squishVersion>-toolkit<toolkitVersion>-<platform>-<compiler>. Example squish-6.1.0-qt47x-linux64.exe. More info available at the official documentation page. 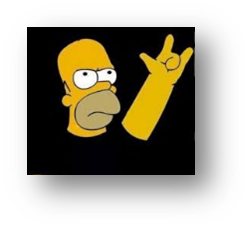 After installing Java as well as the desired Squish package, you are ready to Rock! The bin folder in the Squish directory contains the squishide executable which launches the IDE. 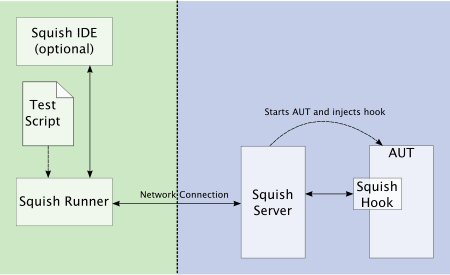 Before exploring the features of the IDE, lets understand the architecture of Squish. When operations are performed from the IDE, they are in the backend calling the Runner and Server only and this implies that both the runner and server can be executed without the IDE also(i.e. from the command line). For learning purposes, its best to use the IDE for now. The Squish Runner reads commands from the script and sends them to the server which is listening for the commands. After the server executes a command on the Application, it communicates the result to the runner which in effect reflects in our IDE. Questions ? Feel free to comment.